Western blot analysis of extracts from Jurkat (human), L929 (mouse), Neuro-2a (mouse) and C6 (rat) cells, using Mre11 Antibody. 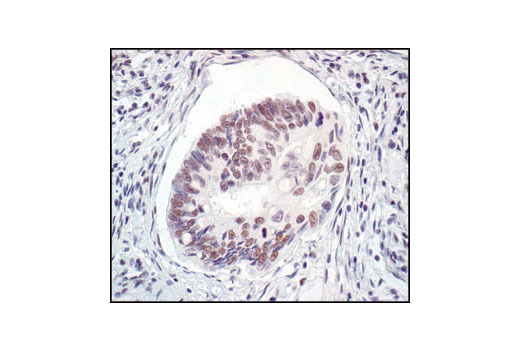 Immunohistochemical analysis of paraffin-embedded human colon carcinoma, showing nuclear localization, using Mre11 Antibody. 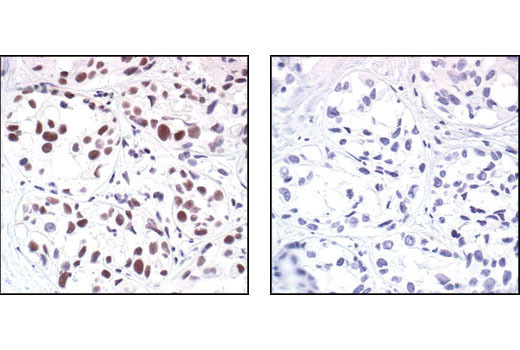 Immunohistochemical analysis of paraffin-embedded human breast carcinoma, using Mre11 Antibody in the presence of control peptide (left) or Mre11 Blocking Peptide #1035 (right). 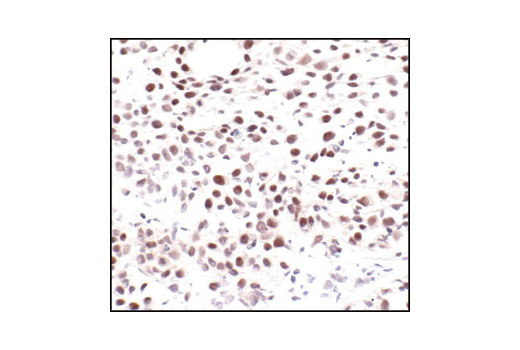 Immunohistochemical analysis of H1650 xenograft, using Mre11 Antibody. Prepare Vector® NovaRED™ (Vector Laboratories) per manufacturer's instructions. Apply 100-400 µl substrate to each section and monitor staining closely. 1-10 minutes generally provides an acceptable staining intensity. 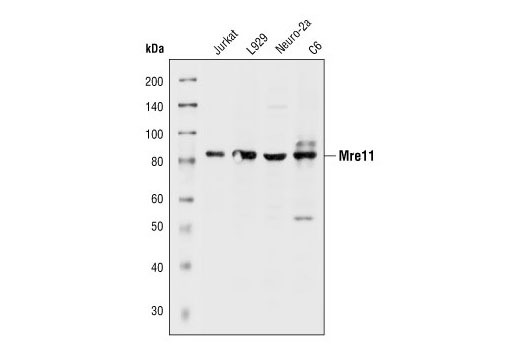 Mre11 Antibody detects endogenous levels of Mre11 homologue A (Mre11A). The antibody may cross-react with Mre11 homologue B (Mre11B). Polyclonal antibodies are produced by immunizing animals with a synthetic peptide corresponding to residues surrounding Lys496 of human Mre11A. Antibodies are purified by protein A and peptide affinity chromatography.